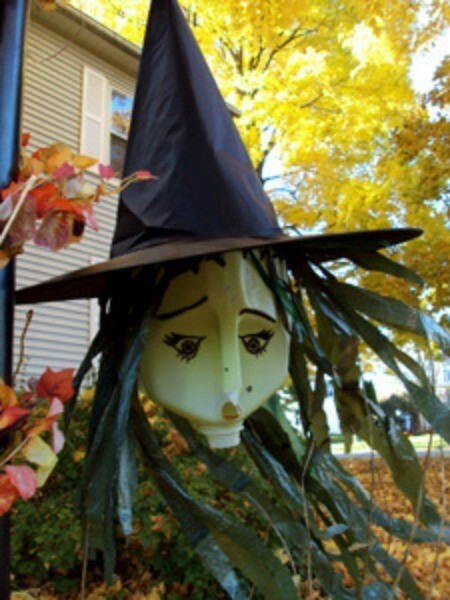 Make a Halloween witch or ghost windsock decoration using recycled milk jugs, plastic bags, and stuff you have around the house! Super easy. Weather-proof too! Did you make the hat or was it store bought? How did you attach it to the milk jug? I will post instructions soon. The witch hat was given to me by a friend. I attached the hat by hand-stitching it to the plastic bag "hair" strips with a double strand of thread. We don't have instructions for this cute project. It was sent in years ago with just the final photo. Perhaps one of our members will be able to recreate it and will send in step by step instructions. If you try it, please let us know how it turns out. I love this Halloween Hag,Gonna make a couple for my front porch.